reasons and includes various kinds of noise. surges or drops to provide a uniform voltage. our AVR will play an important role. fluctuates more than ±10% of the specified value. magnetic leakage is virtually non-existent. 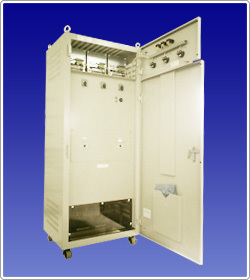 noise filter transformer to eliminate noise. by electrical equipment is virtually non-existent. Our quiet AVR utilizes no moving parts. AVR can be easily cut out of the circuit. without any effects from fluctuations in the input power. Rated input voltage "100, 200, or 400V" Can also be manufactured to other specifications. Acceptable range of inputvoltage fluctuations ±10% "(±10%, -20%)"
Rated output voltage "100, 200, or 400V" Can also be manufactured to other specifications. At rated input voltage and rated load. Temperature dependence According to JEC standards H-type insulation is used for transformer type. Color Standard 5Y7/1 Models with other specifications can also be made.